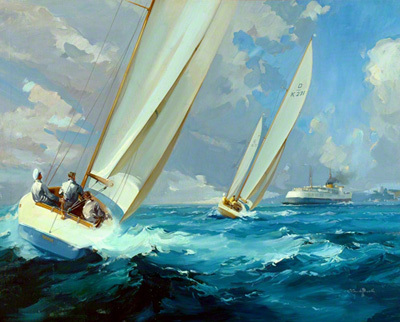 This is the classic railway poster of Racing off Ryde showing the full spirit of the race in the choppy seas off Ryde. Claude Buckle painted this in era when the British Rail ferries crossed to the Isle of Wight and the painting shows a ferry in the background. Created in 1955.